50 foot Section of Steel 6 Strand, 20 AWG Guy Wire. Perfect for Light Duty Masting Down Guys. Comes as 50 foot Hank section. Multiple quantities ordered will come in contiguous footage up to 1000 Foot. Note: Antenna Mast Manufacturers recommend guying masts of ten feet and above in height. When Selecting Guy Wire for use inguying Antenna Masts, Consider the Height, Antenna Size and Wind Loading being presented. 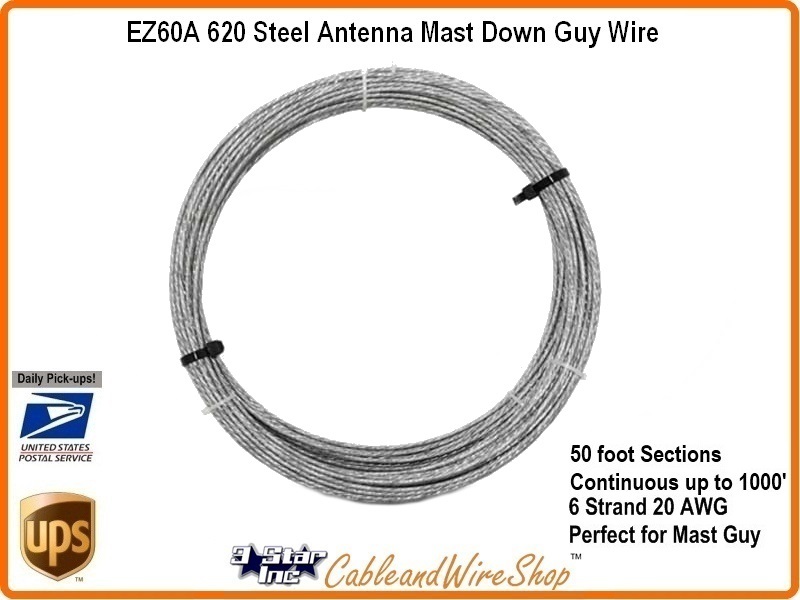 This Stranded (6 Strands of 20 Gauge wire) Guy Wire is Just fine for Most all Antenna Mast Guying Scenarios, However, We recommend that You consider using this wire for Shorter, Lighter Load Applications. Though most mounts come with the minimal amount of requisite hardware, it by no means accounts for all mounting options, materials and custom installation scenarios. Take a moment to consider the options and materials in use. Then select the appropriate hardware to realize your goal. The flexibility and longevity of any mount to match the mounting conditions may depend on it.